A twist on a classic, our 6mm designer satin-finished 14k yellow gold wedding ring with polished beveled edges is the perfect combination of a classic look that has gotten a beautiful upgrade. The flat profile is accented by highly polished beveled edges and is made from brilliant 14k yellow gold. This offers a beautiful luster, as well as ensures that you are wearing a metal known for its durability and shine. With just enough polish to catch your eye, this ring offers the perfect balance of subtle and shine. Each ring we offer includes engraving up to 30 characters including spaces. 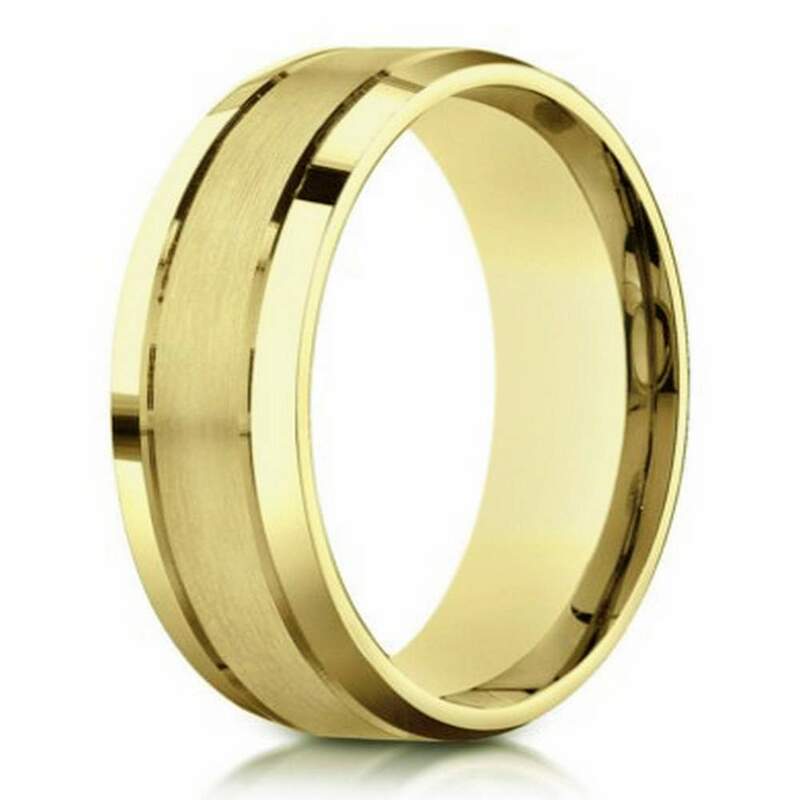 This ensures that the 6mm designer satin-finished 14k yellow gold wedding ring with polished beveled edges is completely unique to your groom, by instilling a lasting message or the date of your union. This ring also features a comfort fit band, ensuring comfort and ease of wear all day long. Comfort fit bands usually run a half size smaller due to the additional metal inside the ring. We recommend having a measurement taken at your local jewelry store before purchase to ensure you are ordering the right size. If you have any questions, please feel free to contact a customer service representative who will be happy to help.